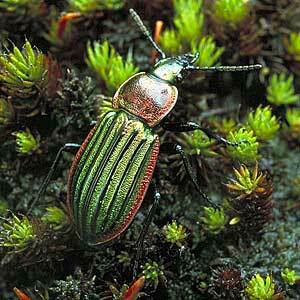 Description: Medium-large (13-18mm), golden-green ground beetle with bright coppery-red foreparts. It is diurnal and often found running on heather moorland in the uplands. Prefers the inteface between wet and drier areas. Recorded only from the northern half in Ireland. World Distribution: A European Boreo-temperate species (53), widespread, but very local in central and northern Europe north to the Arctic Circle. Strongly decreasing in frequency in many areas. Attempts have been made to re-introduce it to areas of its former range in Holland and north Germany. Irish Status: There are no confirmed records south of a line from Carlingford Lough to Sligo Bay. This indicates possible late incursion to our area from adjacent areas of Scotland whence it may have spread southwards. McFerran et al. (1996) report the discovery of substantial populations throughout the main Sperrin Range in Tyrone and on hill land in Fermanagh and Antrim. It also occurs in the hills above Belfast and the Mourne Mountains in Down. Undoubtedly widespread, though not common, in suitable peatlands throughout this northern zone. A total of 23 extant sites are known. Ecology: Primarily a montane species in Northern Ireland and not recorded from lowland peat. Koch (1992), strangely, describes it as xerophilic/eurytopic in central Europe, but in Northern Ireland it is stenotopic for wet, dwarf shrub heath on deep peat. McFerran et al. (1996) found it principally on upland or lowland blanket bog or northern wet heath, but not in drier habitat categories such as submontane heather moor or Nardo-galion acid grass. Lindroth (1992) and others report an association with heather on peat, but remark a tolerance of both wet and dry conditions. The Northern Ireland populations of this species appear to be relatively important in a European context.